venomous snakes | BES Drongos | Follow that monkey! Clash of the Titans – Snakes at NTU! Hey everyone! If you have not heard, last Thursday a king cobra (Ophiophagus hannah) was found fighting a reticulated python(Broghammerus reticulatus) in Nanyang Technological University (NTU) (see the photo below by Abhishek Ambede!). The fight ended when the king cobra escaped into the bushes and NTU’s pest control unit captured the python. 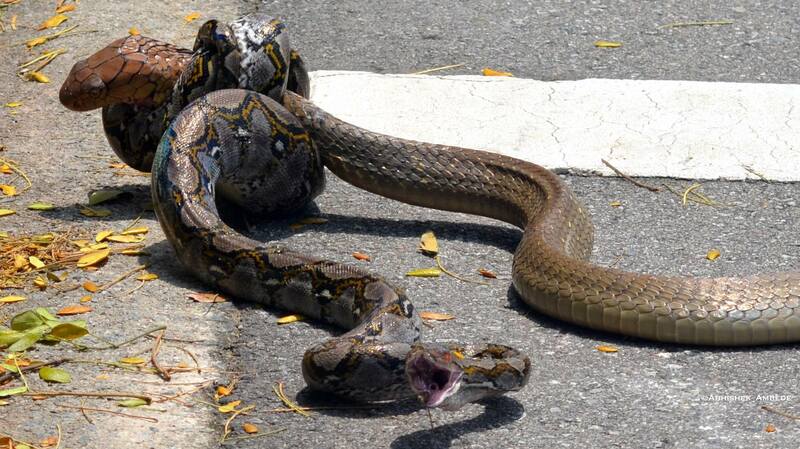 The python was released into the forest and the king cobra was caught later before it was sent to the zoo. These two species of snakes are huge, with the king cobra being the world’s longest venomous snake1,2 (longest recorded length of 5.85m)2, and the reticulated python is the world’s longest snake (longest recorded length of more than 10m)3, making this truly a clash of titans. Find out more about the two snakes and what should you do when you encounter a snake below! Like other cobras, king cobras are highly venomous1, and possibly due to their size, they have large venom glands that produce so much venom that even elephants have been known to die from king cobra bites2! The king cobra utilizes this venom to prey on other snakes and, occasionally, monitor lizards1. As for its distribution, the king cobra is found widely throughout both South and Southeast Asia and within Singapore the king cobra has been found in both our forested areas and urban areas2. Another unique feature of king cobras is that unlike other snakes, king cobras will use dead leaves to make a nest for their eggs and the female will guard the nest until they hatch1. Unlike the king cobra, the reticulated python is non-venomous but instead uses its large muscular body to constrict its prey, usually mammals, to death3. Similar to other pythons, the reticulated python possesses heat-sensing pits on its upper lips that helps it to find its warm-blooded prey1. 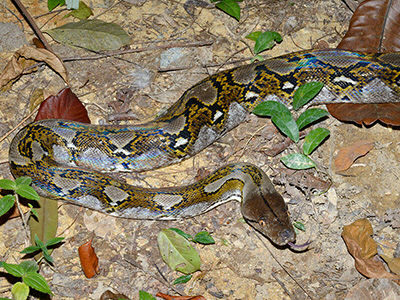 The reticulated python is found throughout Southeast Asia and it is highly adaptable resulting it being found in a variety of habitats in Singapore like forests, mangroves and built up urban areas1. The reticulated python however is not seen regularly due to its nocturnal lifestyle1. Snakes generally want nothing to do with humans so you might find that snakes would rather run from you than to attack you. As such, if you do see a snake, just maintain a respectful distance and give the snake room to escape. DO NOT approach the snake or attempt to capture it. If you feel the snake needs to be relocated or it is injured do call the Animal Concerns Research& Education Society’s (ACRES) animal rescue hotline at +65 9783 7782. We would also suggest downloading the “Snakes of Singapore” app by Wildlife Reserves Singapore (WRS), which is available for iOS and Andrioid, onto your phone so that you can identify any snakes you may see. 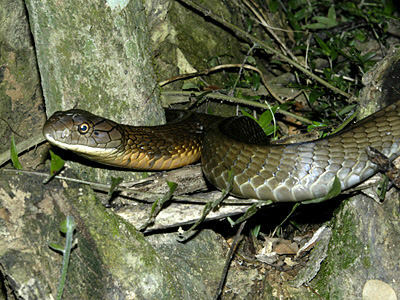 If you would like to find out more about snakes, check out the Herpetological Society of Singapore’s (HSS) blog here: https://herpsocsg.wordpress.com/! Lim, K.K.P., Leong, T.M., & Lim, F.L.K. (2011). The king cobra, Ophiophagus hannah (Cantor) in Singapore (Reptilia: Squamata: Elapidae). Nature in Singapore 2011, 4, 143-156. This week the Drongos had some special guests with us, the Toddycats! The Toddycats are nature and environment volunteers with the upcoming Lee Kong Chian Natural History Museum, and they run another trail in MacRitchie, called the Venus Loop that is located further down Upper Thompson. The Toddycats also manage the Love Our MacRitchie Forest movement, which was launched in response to the proposed Cross Island Line (CRL) that would cut through MacRitchie. The Toddycats hope to educate the public through their walks about the fragile ecosystem and stunning biodiversity we have here through their trails, and the Drongos are hoping to follow in their footsteps. So in a way, the Toddycats are our mentors, and we certainly learnt a lot from them on this trail. This trail was also pretty special because it was the first time our volunteers were presenting to non-Drongos, and we are proud to say that they are shaping up to be promising guides! However, we all certainly still had a lot to learn, as the Toddycats amazed us with their uncanny ability to spot all sorts of biodiversity along the trail. So for today’s post, there are a whole lot more animals, and we hope that with more experience we can someday be as sharp as the Toddycats in spotting such amazing creatures! This Ornate Coraltail (Ceriagrion cerinorubellum) was flitting around near the boardwalk. 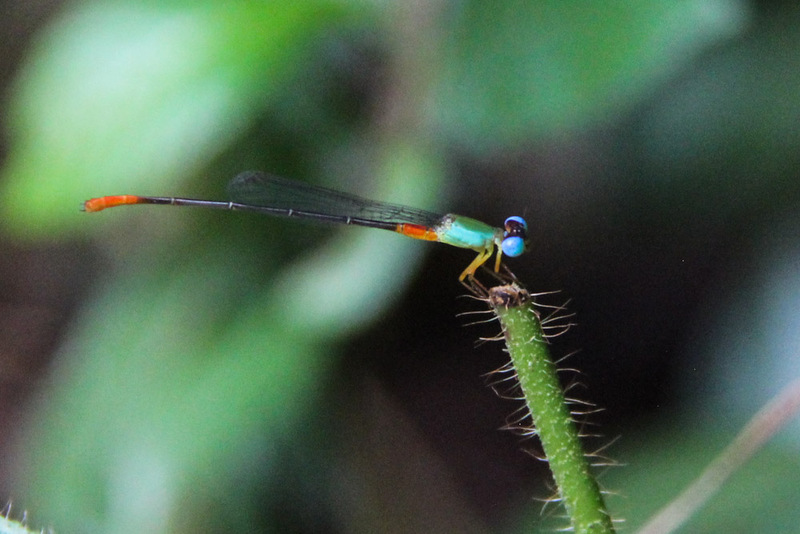 The Coraltail is a damselfly, which is not the same as a dragonfly, even though they look very similar. Both dragonflies and damselflies are from the order Odonata but are generally classified into two different suborders, with dragonflies under Anisotera and damselflies under Zygoptera. The most obvious difference between dragonflies and damselflies is that damselflies have a long, slender body as compared to dragonflies, which have shorter, stockier bodies. We were very lucky for this trail as we spotted both a Malayan Blue Coral Snake (Calliophis bivirgatus) and Wagler’s Pit Viper (Tropidolaemus wagleri )(photo below), highly venomous snakes that we had not seen since our first recce of the trail. 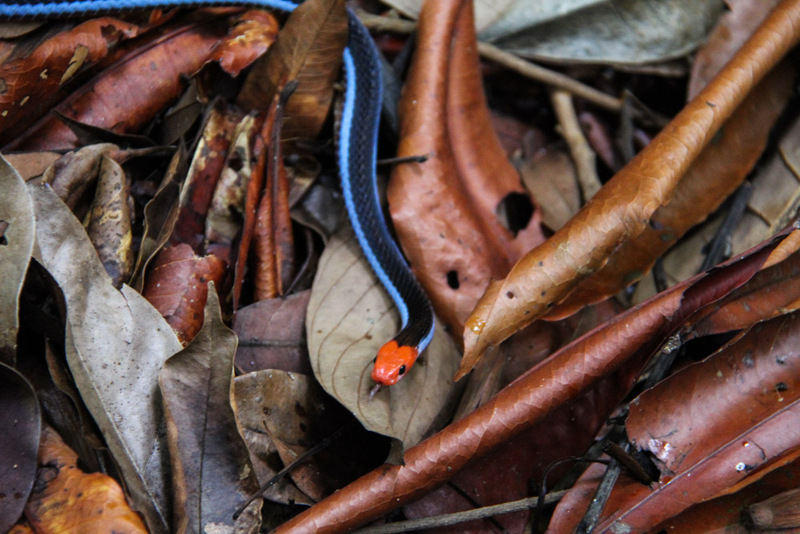 A fun (and rather frightening) fact that we learnt from the Toddycats was that the Malayan Blue Coral Snake is also known as the Hundred Paces Snake, because its venom is so powerful that a person can only make it about a hundred paces after being bitten before they die. Ouch. It seems that the snakes like to bask near the boardwalk because the vegetation is not as dense there and thus has more sunlight. Because venom takes a while to make, it a good thing to remember that snakes generally will not attack non-prey animals (for example, us) unless they are highly threatened or cornered, so if you ever see a snake, give it some room and back away slowly so as to not startle it. Always ensure that the snake has an escape route, and you should be fine! Another interesting reptile we saw today was a Clouded Monitor Lizard (Varanus nebulosus), named as such because it has beautiful yellow cloud-like markings on its back. 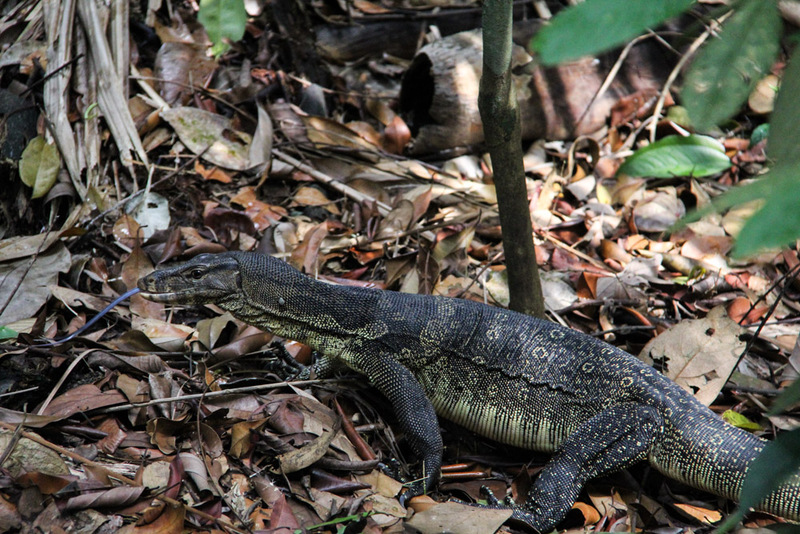 Monitor lizards are closely related to Komodo Dragons (the largest lizards in the world which grow up to 3 meters long), but thankfully all the Monitor Lizard species in Singapore are unable to grow that big. 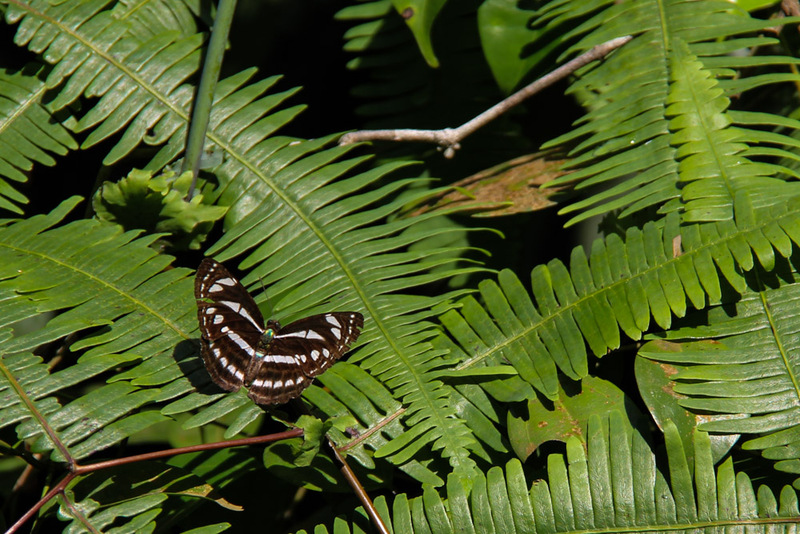 This Common Sailor butterfly (Neptis hylas papaja) was resting on some Resam ferns (Dicranoptris linearis). Both the Common Sailor and Resam like the sun, and both are common species found on nature reserve fringes. Speaking of butterflies, we found this fantastical caterpillar (Eudocima smaragdipicta) creature so strange that it really seems otherworldly. 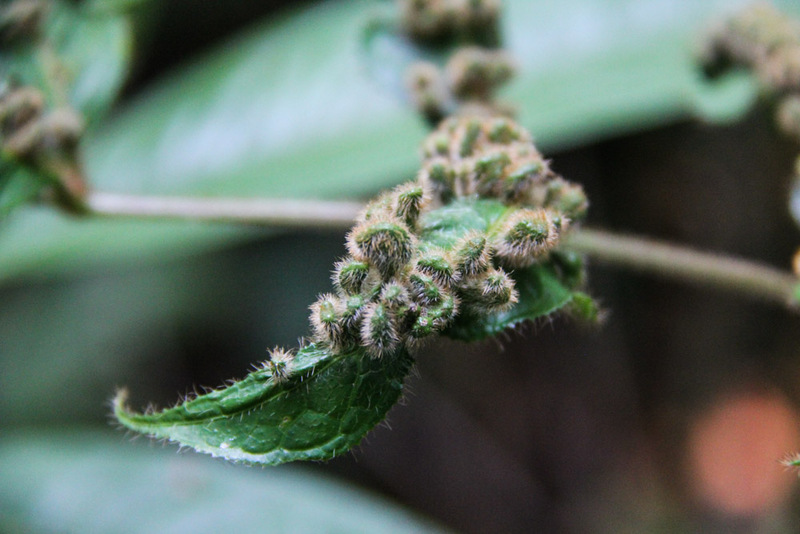 Other than the weird Pokémon ball-looking patterns found on its body, the oddly shaped “head” at the end of the caterpillar facing up in this photo is actually its tail! The caterpillar uses its false head to give the impression of a rearing snake as it raises its behind, serving as a defense against birds and other hungry predators. While we are on the topic of fake snakes, we also found the flower of the Rattan Plant (above) and the resulting fruit (below). 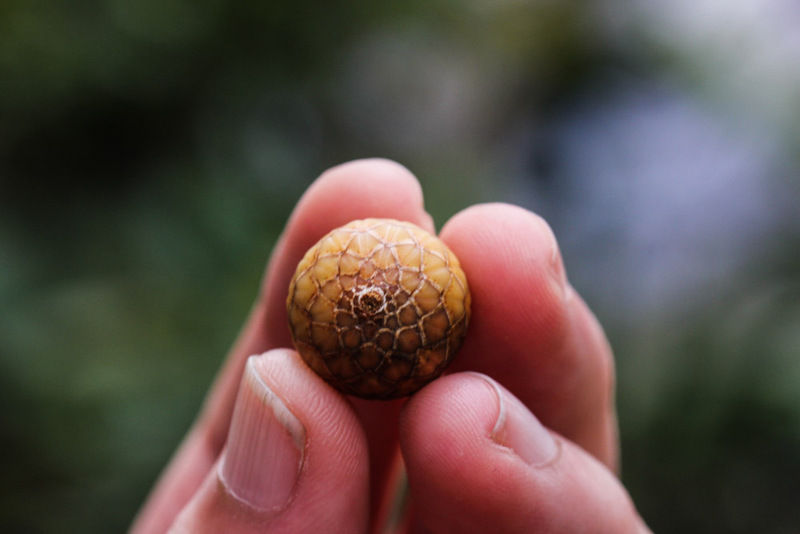 The scaly fruit develops in between the “cups” of the long, segmented flower, and the cups only fall off after the fruit is ripe, exposing the fruit bunches. As most of us know, the main stem of the plant is often used to make furniture and other products (like canes), but did you also know that the fruit produces a red resin known as “dragon’s blood” and is often used to dye violins? For more photos, check out our Flickr albums!